Marriage is like a shoe. 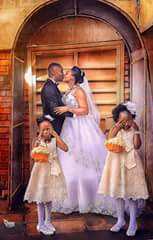 When you wear oversize, be ready to drag it along throughout life, and when you wear undersized be ready to feel the pains throughout life" One thing about marriage is that you don't drop your shoe or remove it at any point, no matter how painful or how stressful it is. That is why I thought it necessary to write you this article. Do not look for the beautiful ones, the nice ones or the cheap ones. Look for the one that is your size. Not every handsome, wealthy or intelligent brother is for you, not every beautiful woman is for you. Look for the one that is meant for you, the one that aligns with your values and belief, the one who you meet at your life's journey. It is important to know where you're going in life before you think of getting a wife or accepting any marriage proposal. All sizes of shoes are not placed in the same place. There is a place for court shoes, laced up shoes, sport footwear, snickers etc. We have Children sizes, young people's sizes and the adult sizes. Know where to get your own shoe. READ ALSO: How To Makes Godly Friends That Will Lead To Marriage. Your size cannot be everywhere my brother; your type cannot be everywhere my sister. You cannot be a Christian and be looking for a wife material at a night club. Your wife or husband can't just be everywhere. Stick to your values and therein you shall find someone like you, but when your values are not defined anyone can just match you. Discover yourself and define your values. In this kind of shoe purchasing enterprise, you are not permitted to try the shoe before you buy. This is why it is important to seek guidance and counseling, from people who have bought shoes before or are into the business of directing people to the right shoes (Pastors and Relationship coaches). And most importantly to avoid much time wasting time simply consult the shoe manufacturer (The Almighty God) to tell you your size. "You do not prepare for wedding, you prepare for marriage." Ladies these days get so motivated when they attend wedding and they will quickly want to say yes to that brother. Wait!!! It is not just the wedding oh. The wedding is just one day. After the wedding what next? Finally, it is not something you rush to the market and just pick a shoe because you like or can purchase it. Who made it? Is she/he of the same faith? (This is compatibility). Will it match me? (This is whether he/she loves you and will accept you the way you are). Dear friends, remember many are dragging their foot and they would hardly reach their destinies, many are feeling endless pains and wish they could pull off the shoes but no way. I have seen people with beautiful shoes and when they show you their foot, you will see scars. Beloved, it is not about the physical, it is the size. You can't know the size from afar, so come close, build a relationship first but remember '’you are not permitted to try it before you buy it'. And for those who have purchased the wrong shoes, you can still make it your size again if you will consult the manufacturer and let Him have His way in your marriage. God bless us all.